A piece of Kelly found its way home to her family last month as one of Kelly’s dogs, owned when she was married and living in Colorado, came home to the Rothwells to stay. 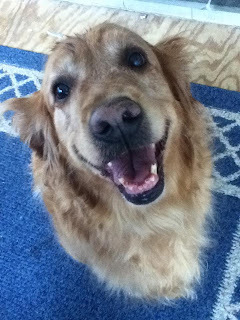 Lucy was one of two Golden Retrievers that Kelly’s ex husband Doug Sanders and Kelly had had when they lived in Norwood Colorado on 40 + acres. Lucy was always Kelly’s dog. Kat’s voice trembles a bit at the memory.The loss of her best friend has hit her very hard. She and Kelly were virtually inseparable friends; they met in 1996 in college at Adams State in Alamosa, Colorado.They went everywhere together. “We were always affectionate and hugging each other all the time,” Kat laughed. “People use to tease us, but we were just very close; we spent a lot of time together. We both were into spiritual healing and Reike and we both loved crystals. We had a wonderful connection with one another..."
Kelly was studying geology at Adams State and in 1997 she met Doug Sanders in one of their classes. According to Kat, Kelly and Doug were like two peas in a pod. So when Doug told Kat he had a friend named Jason Jayroe she should meet, Kat did and soon the four of them went everywhere together. In June, 2004, Kelly Rothwell and Doug Sanders were married. Kat Jayroe was Maid of Honor in Kelly’s wedding. Jason was Doug’s Best Man. When Kat and Jason got married, the roles were reversed; Kelly was Maid of Honor in Kat’s wedding and Doug was Jason’s Best Man. The four friends stayed close and lived near each other until Kat and Jason moved from Telluride to Fort Collins, about 6 hours away. But they called each other often. Meanwhile, Doug, Kelly, Clarence and Lucy all settled down as a family; Doug was a ski instructor in Telluride, Kelly in Human Resources for The Peaks Resort. Lucy and Clarence grew fat and happy. In September of 2007, Kelly’s company sent her on a business conference to Florida. When she came back, Kat said she was changed. No one knew at the time that that person was David Perry, who later would become the only suspect in Kelly's disappearance last March 12th. In June of 2007, Kelly made the decision to leave Colorado and move to Florida. She packed up everything that she wanted into her green Subaru and drove to Florida. She left Lucy and Clarence with Doug. Doug Sanders rented his house out and spent that summer in Australia as a ski instructor there. Friends watched the dogs for the summer. When he came back from Australia, he opted to keep renting his house out, opting instead for a smaller apartment that was much closer to his job. But with that consolidation came space issues; Clarence and Lucy were both big dogs and Doug didn’t have enough room for both of them. Jason bought a large dog crate and Kat worked with Lucy for a few days helping her get used to it. “Lucy is just such a great dog; she is so mellow and well-behaved. I just love her!” Once again, emotion takes hold and Kat sits quietly for a moment before speaking again. But giving Lucy up was the hardest part for Kat. Lucy represents to her all that Kelly was; vibrant, strong, alive, beautiful. Lucy was Kat’s last real connection to Kelly; to give that up was very difficult. Kat said goodbye to Lucy at the house, then sat in the front yard and cried for her friend. So as one door closes on this story, another now opens. After a long 7 hour plane ride and a few delays, Lucy arrived safe and sound in Maryland and is now in the care of Nancy Rothwell, Kelly’s mother. According to Nancy, she is adapting well and sleeps beside the bed, just within an arms gentle reach of her. Nancy feels blessed to have her. Lucy is now at home, among the things and people that helped shape Kelly Rothwell. Lucy is much loved. Its been a year and still there is no word on where Kelly is or what happened to her. Meanwhile Kelly Rothwell is still missing….. I'm so happy for the Rothwells! Continuing to pray for Justice for Kelly! Thank you for sharing this wonderful moving story. It is nice that the Rothwell's have Lucy and I bet Lucy knows that they are Kelly's family. It was also touching to hear about Kelly's best friend and how close they were and it was generous of Kat to share all of this and my heart goes out to her. You continue to do a great job sharing information about Kelly and even though I never knew her your words and how the Rothwell's and close friends of Kelly's share with you let us know the many beautiful things about her. Thank you very much for continuing your blog. Lucy is beautiful. I'm so happy that she is home with the Rothwells. Keeping all in my prayers, including Doug, Kat, Clarence, and Lucy. Hurry home Kelly. Great article Leigh! I'm glad Lucy has found her forever home! I'm sure she can feel the familiar love of Kelly through the Rothwells. My heart breaks for the Rothwells and for her friend Kat! Praying for Kelly's return! As always great article Leigh. I cannot believe that one year has past already that Kelly went missing. My heart aches for the Rothwell's and they are always in my thoughts and prayers. What Kat did is a wonderful way to bring a part of Kelly home. I pray that someone will remember something even if they think it doesn't really mean much as sometimes they are the clues that lead to the evidence. I pray that Kelly will be found soon and brought home so the Rothwell's can have closure. I pray that justice will be done to the person that took Kelly away from her family.